Buy 4 Hydrafacials, Get the 5th One FREE! SAVE EVEN MORE, ONE DAY ONLY! Use a Holiday or Spring/Mother’s Day Gift Card to buy your package on Friday, May 31 in any of our seven salon locations! Join us for our Hydrafacial Package Kickoff Event! $50 MedSpa Voucher can be used toward your Hydrafacial Package OR any MedSpa Retail Product the day of the event. $50 per reservation – Click here to reserve your spot! Your experience will start with a lymphatic treatment that diminishes puffiness of the face; followed by intense cleansing and hydration sure to give your skin a new lease on life. With a rejuvenating peel, a specialty booster, and LED light, this treatment is sure to reveal a younger, more radiant complexion, and youthful glow. 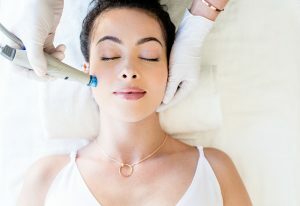 All the amazing benefits of the Signature Hydrafacial are boosted with a specialty vial, formulated to address your specific concerns; followed by an LED light treatment to help reduce inflammation and promote collagen. This treatment helps to minimize fine lines and wrinkles. You will leave feeling refreshed and revived. The Signature HydraFacial treatment for your face as well as your neck and décolleté. LED light treatment included. A three-step process that begins with an exfoliating dermaplane. Next, prepare for the secret weapon of the stars, the magical anti-oxidant packed Hydrafacial! Ending with an exfoliating and plumping lip treatment. After this treatment your skin will be lustrous! Utilizes super-serums filled with antioxidants, peptides, and hyaluronic acid to boost hydration, help address the signs of aging, and protect skin from environmental aggressors, leaving it recharged, renewed, and invigorated. Hydrafacial Packages will be available to purchase from Fri, May 31 to Thur, June 6 in all seven salon locations. Use a discounted Holiday or Spring/Mother’s Day Gift Card as a special offer for ONE DAY ONLY on May 31. Bonus E-Gift Cards CANNOT be used to purchase a Hydrafacial Package. You may purchase more than one Hydrafacial Package at a time. Hydrafacial Packages never expire and never lose value.